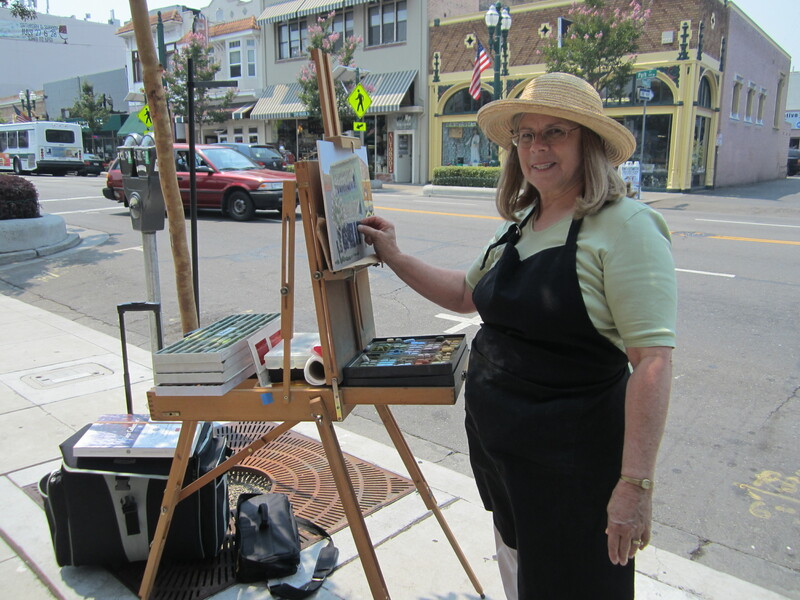 It was quite a week painting in the Frank Bette Arts Center Plein Air Paint Out from July 29 – August 3, 2013. 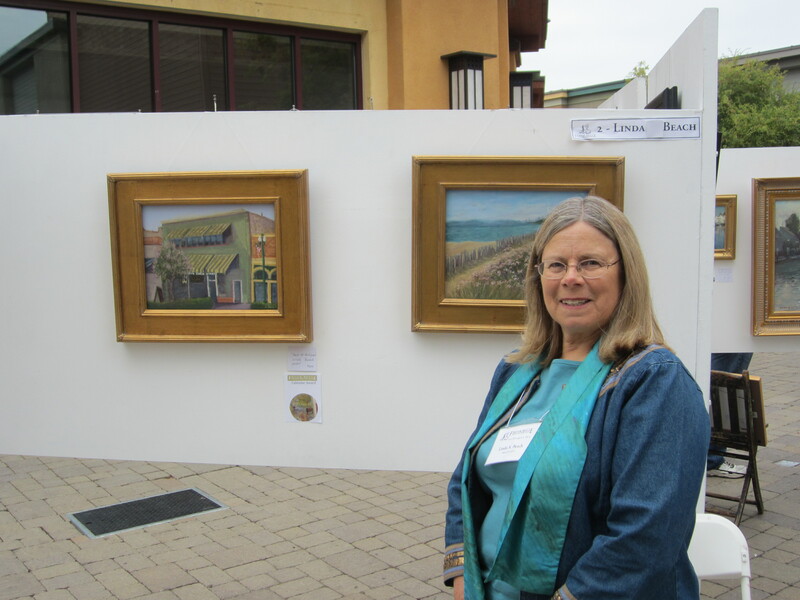 Forty artists were invited to paint on location in Alameda, CA and show their art work at the show and sale on Saturday at the South Shore Shopping Center. Monday: I arrived at the Arts Center to have my blank pastel boards to be stamped to show that no work was started before the appointed time. 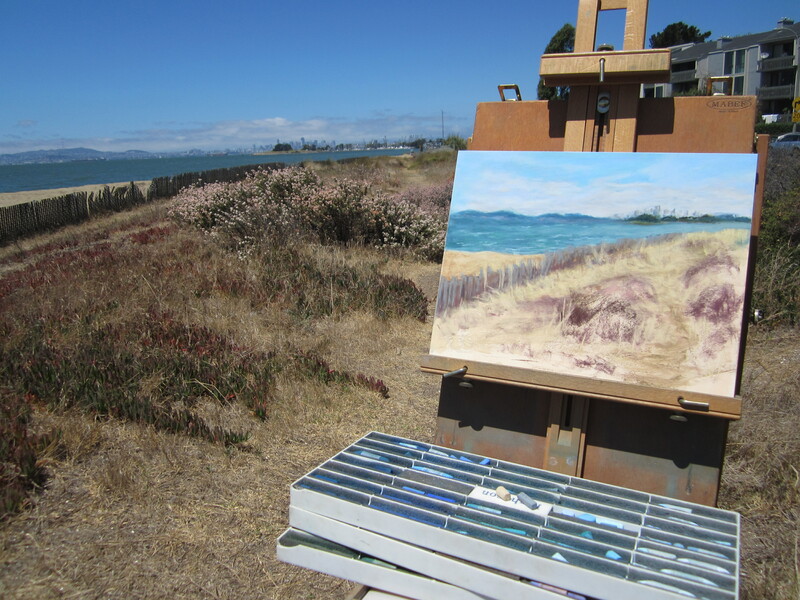 After searching for parking, I set up my easel for painting Park St. Antiques in the commercial hub of Alameda. 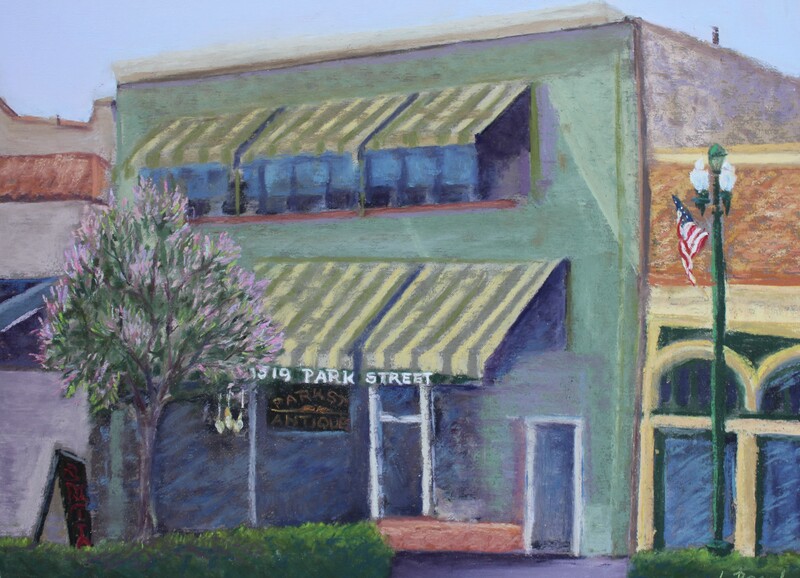 Here is the completed painting of the Park St. Antique store which sponsored a page in next year’s calendar. Tuesday: A windy and cool day to paint a sailboat by the Encinal Yacht Club. I was happy with my color and soft focus of the distant hills and fog. The challenge was to simplify the busy scene and to model the hull of the white sailboat. In the end, I think I need to show more contrast in the shadow to have this read correctly. I got lost in time and enjoyed the scene, but need to work on SPEED PAINTING! Each night there were social events planned which is great for exchanging ideas with like minded plein air painters. It was great fun and hors d’oeuvres at Dragon Rouge Thai on deck beside the estuary one night and a member’s backyard another evening. The forty artists came from CO, NC, Northern and Southern CA. Wednesday: Quick Draw check in required an additional stamp before heading out to paint the Victorians around Grand St. I painted an Eastlake cottage on Paru Street. The contrast of the soft landscaping against the moss green clapboards caught my attention. But, what a challenge to paint the off white gingerbread trim by 1 pm! It was a mad dash to frame the piece in the back of my car and return for the hanging and show by 2pm. Note to self: Smaller size paintings next time – 9×12 or so. Thursday: Enough working on fussy architecture! It was time to savor the landscape by the San Francisco Bay. 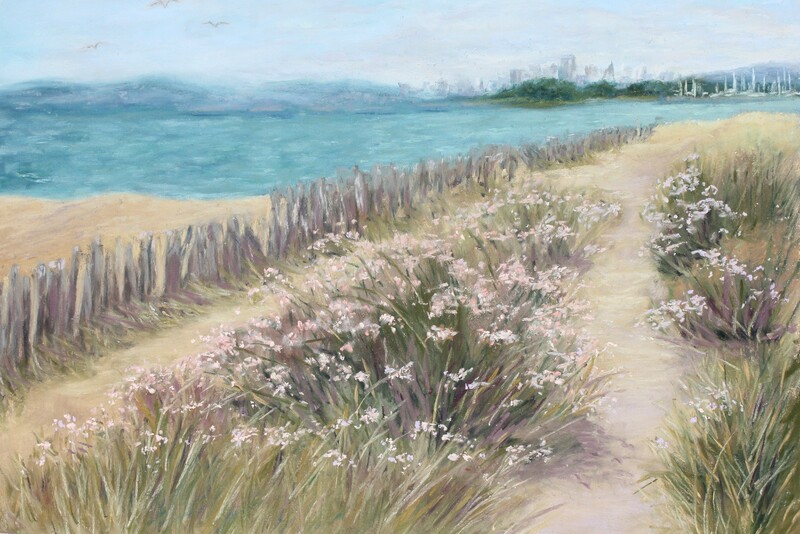 So, I set up the easel in the sand dunes along Alameda Beach with the beautiful softness of wildflowers called “Sea Rocket” and “Coastal Buckwheat”. Friday: The day was dedicated to tweaking the three paintings this week, photographing, and framing them for the show and sale. Saturday: The big reveal! Check-in and hang paintings on panels with fishing line attached by nails in the top edge. The South Shore Shopping Center in Alameda hosted the Show from 10 to 5. I was competing and exhibitng with many talented artists. The juror was Kay Carlson. Although I did not earn a top prize, I did win the Calendar Award and $100 prize for my painting “Park Street Antiques”. The Frank Bette Calendar for 2014 will have a month with my painting featured. 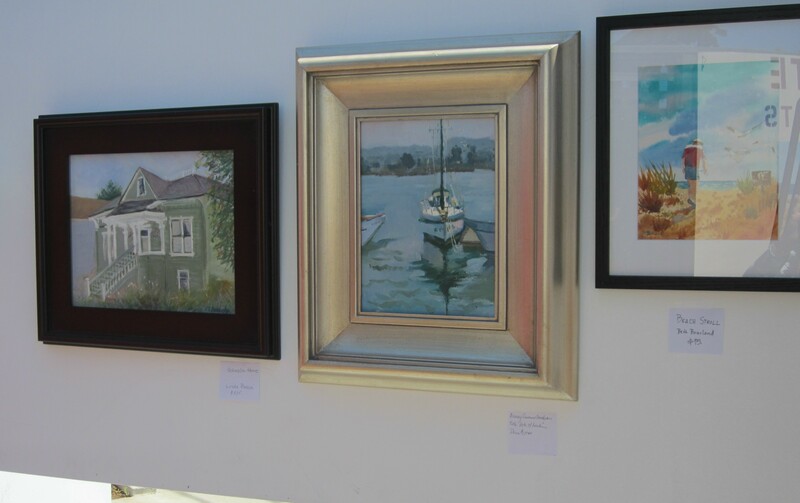 Then I checked in the Beach and Antique Store paintings to be exhibited at the Art Center from August 9th through September 28th. What a week. It is getting time for a vacation!